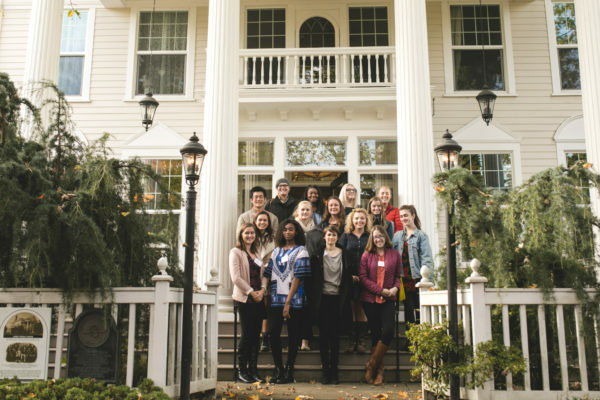 Feminist Camp is a weekend camp for college-age students that goes beyond classroom or campus activism for networking and learning more about feminism. 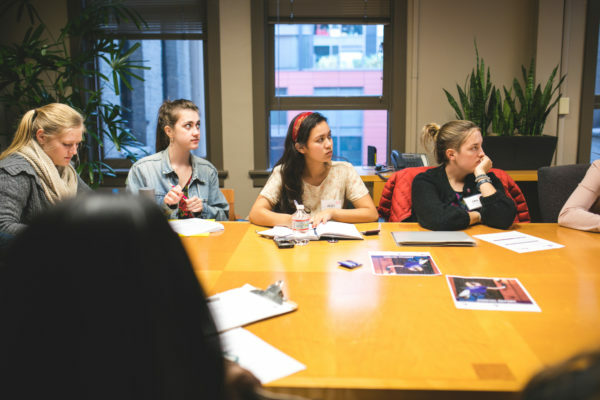 While Feminist Camp was originally based in New York, it has since expanded to the Seattle area. I had the opportunity to speak to the campers last November, and also got to interview the camp organizers! What are your official roles at Feminist Camp? KATIE GALLAGHER: I’m one of the Feminist Camp Seattle directors, along with Jody. JODY JOLDERSMA: I’m the other Seattle director, along with Katie. CARLY ROMEO: I’m the Feminist Camp Director, I run all the sites! KATIE: Feminist Camp is a transformative experience. I attended the NYC program when I was a senior in college and emerged as an entirely different person by the end of it. Being immersed in a constant exchange of big ideas (from both experts and campers!) shaped who I am as a thinker and an activist. I left camp with a stronger feminist network, a new perspective, and the kind of renewed energy that can only come from spending a week with passionate, driven people. JODY: I attended the Feminist Intensive program in NYC, which visited many of the same organizations as the week long program but is targeted at professional mid-career women. I was introduced to A.I.R. Gallery (the first women run cooperative art gallery in the United States) during my session. As a professional artist this was a great opportunity to expand my network and was pivotal in my career. CARLY: Feminist Camp is an intimate week-long conference for folks who want to further explore what feminism looks like beyond theories/campus activism. It’s one part inspirational retreat, one part professional development, and one part launchpad. What’s the origin story for Feminist Camp? What made you want to set up Feminist Camp? CARLY: The program started as an offshoot of Soapbox Inc., a feminist speakers’ bureau that was founded by feminist authors Amy Richards and Jennifer Baumgardner. After a few years of visiting college campuses on speaking and book tours, Amy and Jennifer conceived of a program that would bring the campus to them — specifically, to NYC. The week-long version of the program has been going strong now since 2006 (twice a year, once in January and once in June) and now we’re expanding to other locations and shorter programs so that we can get more folks involved. Seattle campers on the steps of the Judge Ronald House in Seattle. Feminist Camp has been pretty successful in New York, and I see it’s also going international with a camp in Zambia! Why did you want to bring it to Seattle? KATIE: After reminiscing about how incredible our Feminist Camp experiences were, Jody and I were inspired to offer the same opportunity to west coasters. We took a chance and reached out to Carly about holding a program in Seattle. We figured it would be the perfect place, given the vibrant social justice scene and our connections to organizations involved in feminist work. As luck would have it, SoapBox was already thinking about bringing the program here. I like to think our passion and enthusiasm sealed the deal. What kind of people should be campers? KATIE: We welcome folks of all identities, ages and backgrounds! Anyone with an open mind who wants to deepen their understanding of feminisms would benefit from this experience. What can campers expect from attending Feminist Camp? JODY: Sessions are different and tailored to the location and interests of the individual campers. Each day is focused on a theme and we spend our time in conversation with professionals and activists doing on-the-ground feminist work. On top of the curriculum, campers can expect to meet like-minded individuals in an engaging and supportive atmosphere. I really enjoyed talking to the campers when I met them in November, and I noticed that when we did our introductions, a lot of the campers introduced themselves and said that they were feminists. When campers come to you, what should they know about feminism already? Is there a type of feminism that you focus on? KATIE: While we typically have campers majoring in women’s studies attending our sessions, you don’t need an academic background to reap the benefits of camp. We encourage folks who don’t know much about feminism but want to learn more to sign up! Our goal is to expose campers to a variety of perspectives, so we explore many kinds of feminisms. The one aspect that remains constant is infusing intersectionality into everything we discuss. Are there particular challenges that you face with your organization? CARLY: As I think is common with social justice organizations, it’s a struggle to make sure that the program is accessible to anyone who wants to attend, while also making sure that our work (and the work of folks we work with) is fairly compensated. We have been offering sliding scale admission for a few years now, and in 2017 we are raising money for a scholarship fund. These efforts have seriously increased the diversity in our feminist camp cohorts. What are your goals for the organization? CARLY: Put simply, my goal is to empower feminists to harness their skills and make sh*t happen. Many of our campers identify as feminists but aren’t sure what that can look like in the professional world, or in the activism-outside-of-the-campus world. Many have heard from peers or family members that degrees in Women’s Studies or similar fields are useless. Many feel that there’s no place in the professional world for “people like them” meaning women/people of color, women/people who grew up in poverty, or women/people who are passionate about social justice. But that’s not true, and our goal is to expose them to folks who can be mentors or aspirational figures for them. What is the best thing about your role with Feminist Camp? KATIE: Aside from collaborating with Carly and Jody, who are two of the most revolutionary badasses I know, there’s nothing like watching the campers grow throughout this experience. I’m proud that we’ve created a space that encourages campers to think creatively, learn from each other and forge long-lasting connections with those who share their sense of justice and drive to make the world a better place. JODY: One of the most profound experiences for me is witnessing firsthand the excitement in the campers’ eyes when they see that other feminists feel the way they do, that they are not alone and that these are universal experiences affecting women. In addition, I love acting like an extension cord by bringing people from my personal and professional networks together with people from all walks of life. CARLY: I agree with Katie and Jody, it’s really all about the transformations we witness in the campers. Many will have great “a-ha!” moments throughout the week, often during sessions that don’t even directly relate to what they (thought) they were interested in. Some have those moments after camp, and reach out to share that. The best thing is watching them grow and learn and embrace themselves. Are there any Feminist Camp-organized events happening around the Seattle area soon? KATIE: Yes! We currently have two Feminist Camps scheduled for 2017. We’re holding our traditional week-long program from June 25-July 1. 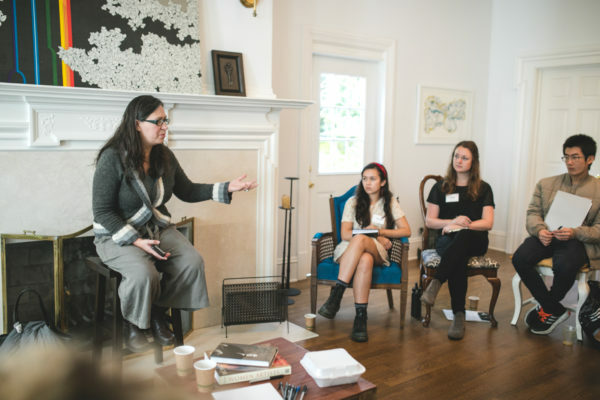 We’re also holding a Feminist Intensive program from November 3-5 for folks who are already established in their careers and want to connect with other professionals. If you’re interested in participating in Feminist Camp, you can find out more about it at their website. MORE: Feminist camp, interview, Seattle, Soapbox Inc.